The country can strangle nearly 30% of the world's oil output and could send prices to $250 a barrel, but some say all the tough talk is still just that. 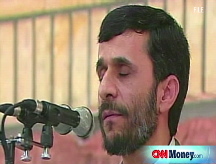 NEW YORK (CNNMoney.com) -- Iranian missile tests. Reports of covert U.S. operations inside the country. Israeli military exercises designed to simulate an attack on Iran. The signs are unmistakable: Tensions in the oil-rich Persian Gulf are heating up. And that matters to oil markets. Iran sits atop the Persian Gulf, through which pass 20% of all the world's oil. Its missiles are also within easy striking distance of the giant oil fields of Iraq, Kuwait and Saudi Arabia. Together, the Middle East produces 25 million barrels of oil a day, or 30% of the world's total daily production of 86 million barrels. What's more, some Iranian officials have threatened to wield the country's strategic position like a weapon. So just how likely is it Iran will be attacked, what would that do to oil prices, and how might the Iranians hit back? To start, experts are divided on whether a threat is imminent. "The likelihood of an attack is the highest it's ever been," said Christopher Ruppel, an energy analyst at Execution LLC, a broker and research firm for institutional investors like hedge and mutual funds, who puts the chances of an attack at 50%. "Right away prices would go above $200 a barrel." Some observers believe the Israelis - threatened by comments from Iran to annihilate the Jewish state - may see the remaining days of the Bush administration as the best time to strike Iran and set back its nuclear program, which Iran says is for peaceful purposes only. On Thursday, following a third Iranian missile test that caused oil prices to spike $5 a barrel, U.S. Secretary of State Condoleezza Rice reaffirmed the U.S. commitment to Israel. "We take very strongly our obligation to help our allies defend themselves and no one should be confused about that," she said. Most analysts believe Iran would not initiate a nuclear strike against Israel, which is widely believed to have its own nuclear arsenal. Ruppel said an Iranian A-bomb would give the country more bargaining power and embolden it in its support of Hamas and other groups fighting Israel. In response to a preemptive strike from either Israel or the United States, Iran would be tempted to fire missiles on key production facilities in neighboring states, according to Ruppel. Targets could include Iraq's oil loading facility in the port city of Basra, which exports most of the country's daily output of more than 2 million barrels, or Saudi Arabia's massive Abqaiq plant, which process over 6 million barrels of crude a day. A successful attack on Abqaiq, he said, would cause sustained oil prices of $200 to $250 a barrel. "If you do it right, you could do a phenomenal amount of damage," he said. Then there's the Strait of Hormuz - the only ocean access for tankers leaving the oil-rich Persian Gulf. Seventeen million barrels a day, mostly bound for markets in Asia, flow through the strait as narrow as 21 miles wide. Iran borders it to the north and its shores are lined with surface-to-surface missiles. Mine-laying ships ply its waters. The U.S. government would likely plan for an Iranian attack on oil fields or an attempt to seize control of the strait. Analysts say that given the strength of the U.S. Navy, Iranian control over the strait would likely be short-lived. Ruppel said the U.S. military has been beefing up the anti-missile systems in Bahrain, designed to protect Saudi Arabia from just such an attack, although he noted the poor performance of such systems during the first Gulf War. Other measures to calm oil prices in the event of a strike on Iran could include releasing oil from the U.S. Strategic Petroleum Reserve or using existing pipelines that can carry about 60% of Persian Gulf oil around the Strait of Hormuz, according to Heinrich Matthee, a Middle East analyst in London with the security-consulting firm Control Risks. But Matthee believes it won't come to that. He said the Iranians would have to be backed into a corner - by being hit with U.S. nuclear weapons or facing a land invasion from U.S. troops, for instance - to attack oil installations. "There are no retaliatory measures for Iran that won't have an impact on themselves," he said. A cheaper and more likely response to an American or Israeli airstrike would be for Iran to use its considerable influence in Iraq to step-up attacks on U.S. forces. With signs that the violence in Iraq may be abating, the Bush administration would not want to face a new escalation, said Matthee, who thinks there is just a 10% chance that the bluster with Iran will actually turn into a shooting war. The war of "psychological pressure" is already underway, he said. "They don't need to do much to increase oil prices - a conflict itself will do that." Other analysts think a shooting war is far from near. Sadegh Zibakalam, a political science professor at Tehran University, said many Iranians are prepared to sit down and talk with the United States. "There are many moderate Iranians within the Islamic regime that also think that there must be some kind of compromise over the nuclear issue or any other outstanding issue between Iran and the United States," Zibakalam told CNN.